One of the sports that I like is tennis. I was enthusiastically following the recently concluded Australian Open 2011 and to my regret, the guy that I was rooting for did not win. I am talking about the World’s Number One–Rafael Nadal. Because this is the guy that I look up to, I always go for the brand that he endorses. Nadal is one of the faces of Nike. 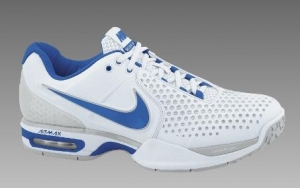 This tennis shoe was inspired by him. It was tailored made to a player like him who has good footwork and impressive tennis skills. rubber shoes, it can be used for almost any sport. There are specific shoes for specific sports and tennis like football needs specific shoes. I had a hard time deciding on Nike’s website because of the lack of knowledge on my part but I opted this after reading that this was inspired by Rafa Nadal. The shoes has holes on the first layer and this part is colored gray. The other half of the shoes is white. The Nike logo check mark is colored black. tennis shoe, the internal aspect of it should support your feet and having an impressive cushion is already a good requisite. Although this shoes is big but it is not bulky when you wear it. It is soft and light on the feet. Again, another requirement on tennis because it aids in giving you faster running ability. also a big factor for me. It makes running and playing the game too enjoyable. I am also impressed with the Air Max sole. In tennis, you always run, hop, whatever position and the entire experience is too intense. One of the things I was looking for in a shoe is having a good sole. The technology used here was very impressive that it did not cause pressure in my feet when it impacts. I am in love with the overall performance of this shoe. It made playing tennis more enjoyable, less stressful to your feet and you are given an edge on better practice.